Late in life, Newton said: 'I seem to have been only like a boy playing on the seashore, and diverting myself in now and then finding a smoother pebble or a prettier shell than ordinary, while the great ocean of truth lay all undiscovered before me'. About two years ago I was working on the ART OF LANGUAGE series, a series of paintings inspired by the languages of our world and concepts unique to those languages. While preparing a talk on the subject, I picked up a mathematical textbook. I wanted to illustrate the point that mathematics is not a language, just as musical notation is not a language. An error in one painting was pointed out to me immediately by mathematician Gerard Michon . While corresponding with him I got intrigued enough to 'enter a time travel machine' (my last brush with mathematics was doing an A level in the subject) and to start reading about mathematics all over again. It is interesting to note that Robert and Ellen Kaplan start off their book (The Art of the Infinite) with a quote by the French poet Baudelaire, who speaks of 'cradling our infinite on the finite seas'. 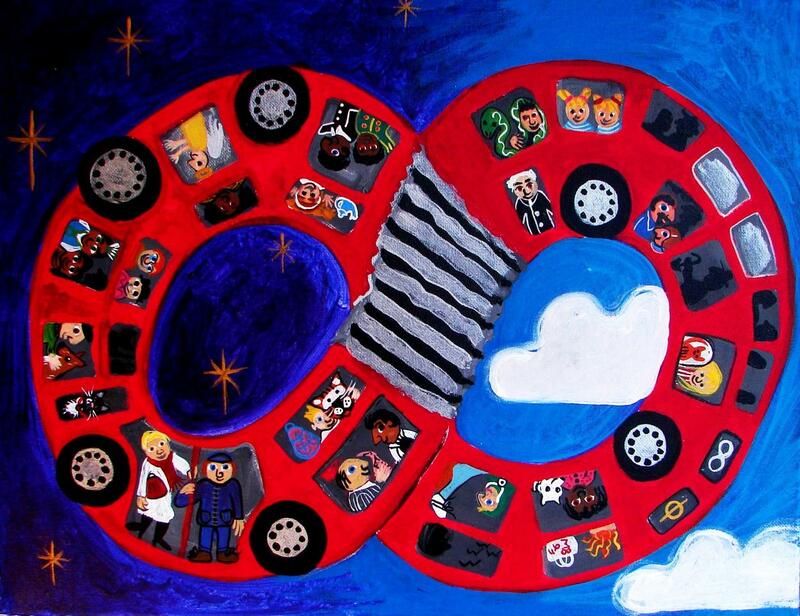 This immediately poses some questions: does infinity live in our mind? Does it live in our language or in poetry? Or was it out there long before human beings conceived of it? Did it exist in the era of the Dinosaurs? Mathematics is the science of searching for patterns to patterns and for connections between numbers. The Greek philosopher Heraclitus said: 'A hidden connection is stronger than one we can see'. Could this be true?! This image appeared before my eyes while waiting for a train recently, while mulling over concepts from mathematics that lend themselves to painting. The 'Implied Spider' from Wendy Doniger's book (or that is my guess! 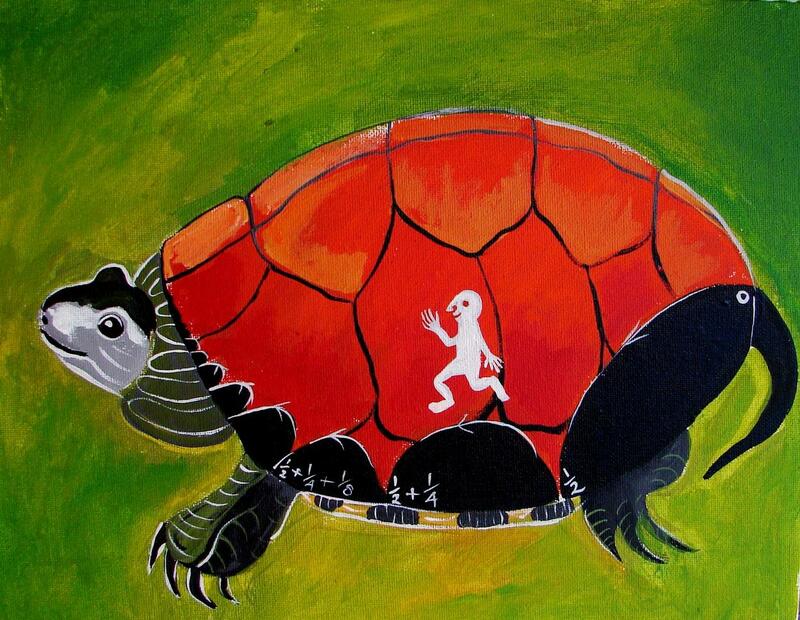 - see bibliography at the bottom of this page) crept in while working on this painting! Robert and Ellen Kaplan say that mathematicians working right at the frontier of the subject must make a 'leap from seeing with the outer eye to the inner eye'. This is the leap from mathematics to the infinite: this must always be so. As an artist, used to working very intuitively, I find this a fascinating statement. For me painting is a marriage between seeing with the outer eye and the inner eye: I paint things I see with my inner eye, but base them on things I see with my outer eye, to take others on a visual journey that, ultimately, makes them look inside themselves. David Foster Wallace (in this book 'Everything And More' ) makes an extremely interesting point about the concept 'abstract'. He uses a basic definition for abstract: 'removed from or transcending concrete particularity, sensuous experience'. He says that 'used in this way, abstract is a term from metaphysics. Implicit in all mathematical theories, in fact, is some sort of metaphysical position. The father of abstraction in mathematics: Pythagoras. The father of abstraction in metaphysics: Plato'. e is a real number constant that appears in some kinds of mathematics problems. Examples of such problems are those involving growth or decay (including compound interest), the statistical "bell curve," the shape of a hanging cable (or the Gateway Arch in St. Louis), some problems of probability, some counting problems, and even the study of the distribution of prime numbers. It appears in Stirling's Formula for approximating factorials. It also shows up in calculus quite often, wherever you are dealing with either logarithmic or exponential functions. There is also a connection between e and complex numbers, via Euler's Equation. e = limn->infinity (1 + 1/n)n.
Its value is approximately 2.718281828459045... and has been calculated to 869,894,101 decimal places by Sebastian Wedeniwski (you'll find the first 50 digits in a Table of constants with 50 decimal places, from the Numbers, constants and computation site, by Xavier Gourdon and Pascal Sebah). Imaginary numbers are based around the mathematical number i which is the square root of -1. In other words: i = the square root of -1, so i^2 = -1. This list (by no means complete) evokes all sorts of images! Particularly Surreal Numbers, Imaginary Numbers and Transcendental Numbers! What might they be?! Transcendental Numbers are numbers that cannot be the result of an algebraic equation (i.e. an equation which only uses the power of x ). The label 'Imaginary' in Imaginary Numbers is thought to come from Descartes, he used the phrase dismissively. Newton thought that they were impossible. It must be pointed out though that to mathematicians they definitely exist!! Apparently they are of vital importance to aircraft designers and electrical engineers. Imaginary numbers are based around the mathematical number i which is the square root of -1. In other words: i = the square root of -1, so i^2 = -1. The pythagorean world was shattered by Hippasus's proof that there were numbers, such as the square root of 2, which weren't the ratio of whole numbers. (I.e. you can't arrive at the square root of two by dividing two whole numbers). Pythagoreans believed that mathematics held the key to the Universe! ^ SMALL NUMBERS, BIG PERSONALITIES! 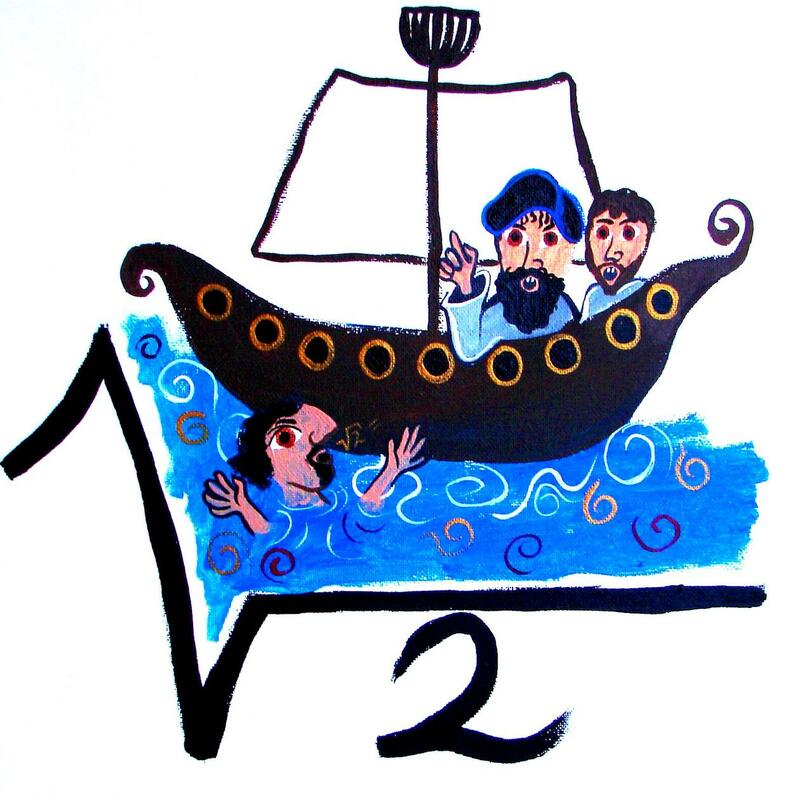 Pythagoreans believed that numbers had personalities. They believed that odd numbers are male and even numbers female! In truth there is no such thing as Pascal's Pyramid - this is a concept of my invention! However there is such a thing as 'Pascal's Triangle'- and it looks like a pyramid. In the painting it is the smallest pyramid. Pascal's Triangle is famous for its symmetry and hidden relationships. Pascal didn't actually invent it, it was already known to Chinese scholars in the 13th century. In Pascal's Triangle each number is the sum of the two numbers immediately above (working from the top down). In Pascal's Triangle the inner numbers form a pattern depending on whether those numbers are even or odd. If we substitute 1 for the odd numbers and 0 for the even numbers, we get a representation which is the same pattern as the remarkable fractal known as the Sierpinski gasket. 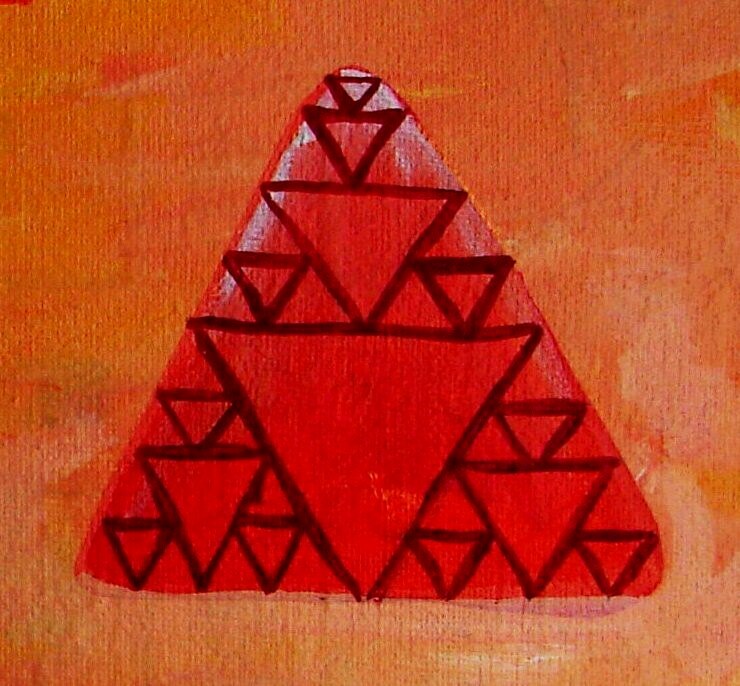 (In my painting this is the medium size pyramid). The German polymath Gottfried Leibniz discovered a remarkable set of of numbers in the form of a triangle. The Leibniz numbers have a symmetry relation about the vertical line. However, unlike Pascal's Triangle, the number in one row is obtained by adding the two numbers below it. For example: 1/30 + 1/20 = 1/12. 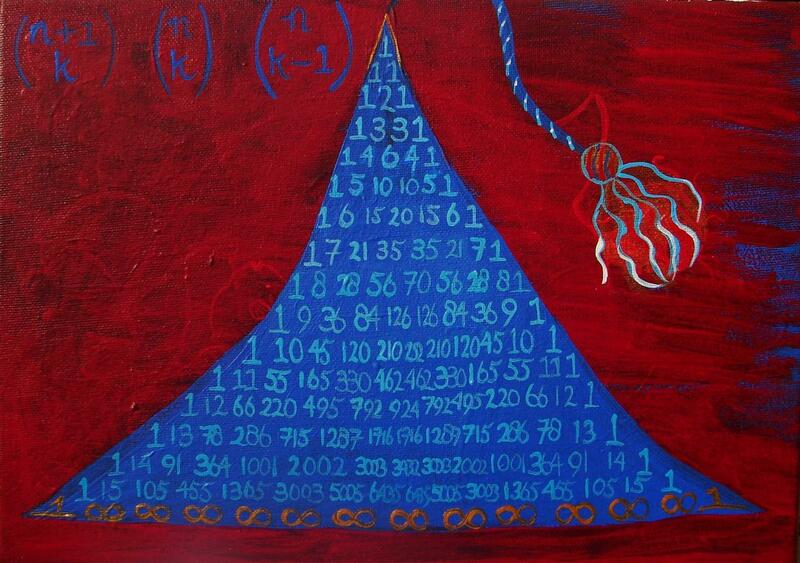 In my painting the biggest pyramid shows the Leibniz Harmonic Triangle. 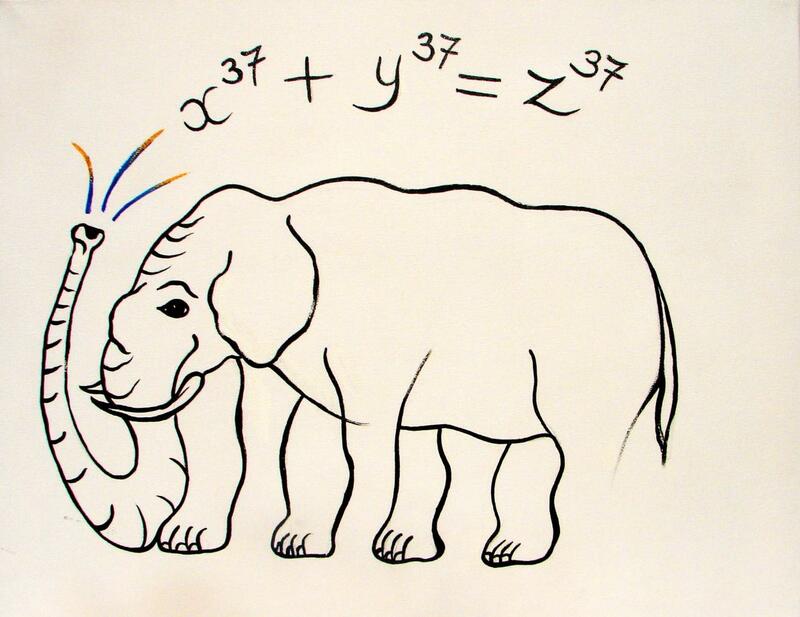 When first reading about Diophantine Equations: an elephant came to my mind. 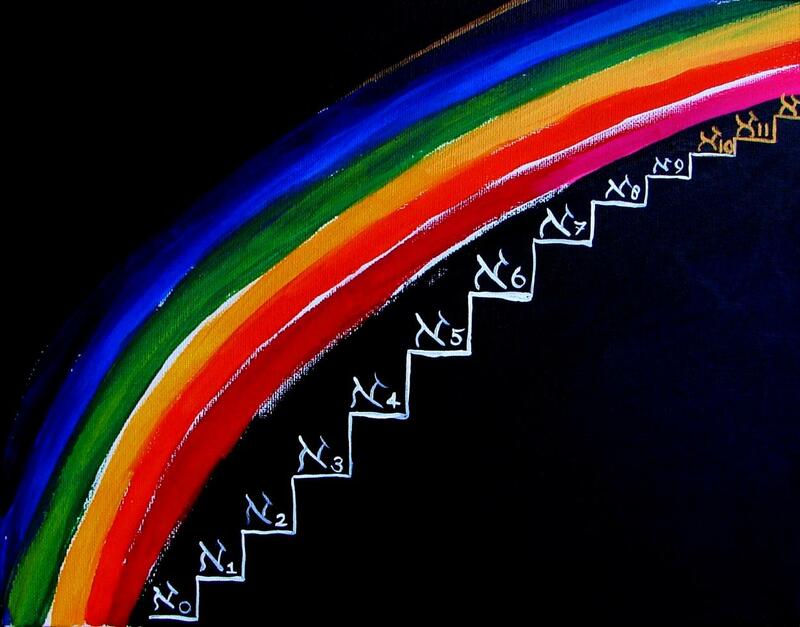 Proving Fermat's last theorem proved a 'mammoth task' for mathematicians. Gerard Michon then pointed out that not all Diophantine equations are elephantine - the linear ones are not. 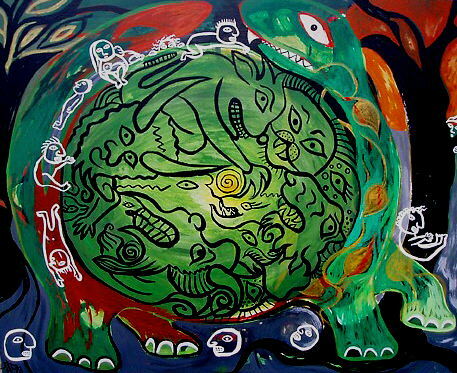 Having acknowledged his point here, this painting is still about an elephant. Something is the matter with this elephant... 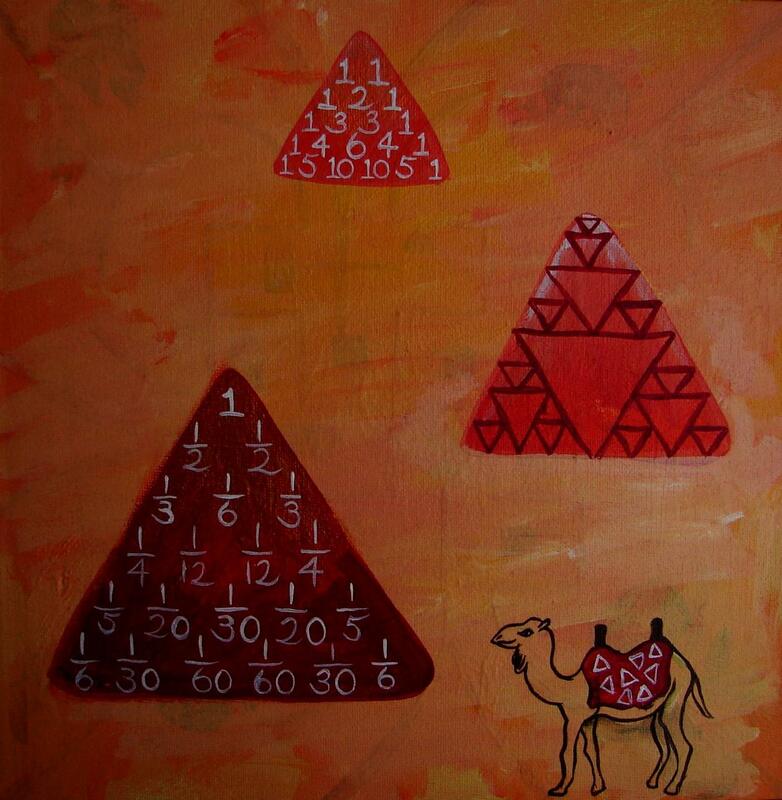 This painting was inspired by an image called 'L'Egistential Elephant' in a book about mathematical patterns. It seems that there will be 'A Mammoth Challenge i' and 'A Mammoth Challenge II': Robin Whitty has drawn my attention to the fact that if I want to 'impress mathematicians' I ought to raise the power in A Mammoth Challenge to 37, rather than 3 (so I did!) He says it wasn't so hard to prove Fermat's Last Theorem for n=3, the real breakthrough was proving FLT for irregular primes, of which 37 is the first. So... back to the easel on this one! Diophantine equations demand that their solution be in whole numbers. They are named after Diophantus of Alexandria whose Arithmetica became a milestone in the theory of numbers. Pierre de Fermat was a 17th century lawyer and government official in Toulouse in France. He was a versatile mathematician and enjoyed a high reputation in the theory of numbers. He is most notably remembered for his las theorem, his final contribution to mathematics. (An explanation follows just below). It is possible to add two square numbers together to make a third square. For instance: 5^2 + 12^2 = 13^2. Can we add two cubed numbers together to make another cube? And what about even higher powers than 3? The answer is that we cannot do that. Fermat's last theorem says that for any whole numbers x,y, and z, there are no solutions to the equation x^n + y^n=z^n, when n is bigger than 2. Fermat's theorem is affectionately known as 'FLT' (or so Gerard Michon tells me). Fermat claimed that he had found a 'wonderful proof', tantalising generations of mathematicians that followed! However Andrew Wiles proved this theorem in 1995. Have you worked out the pattern? 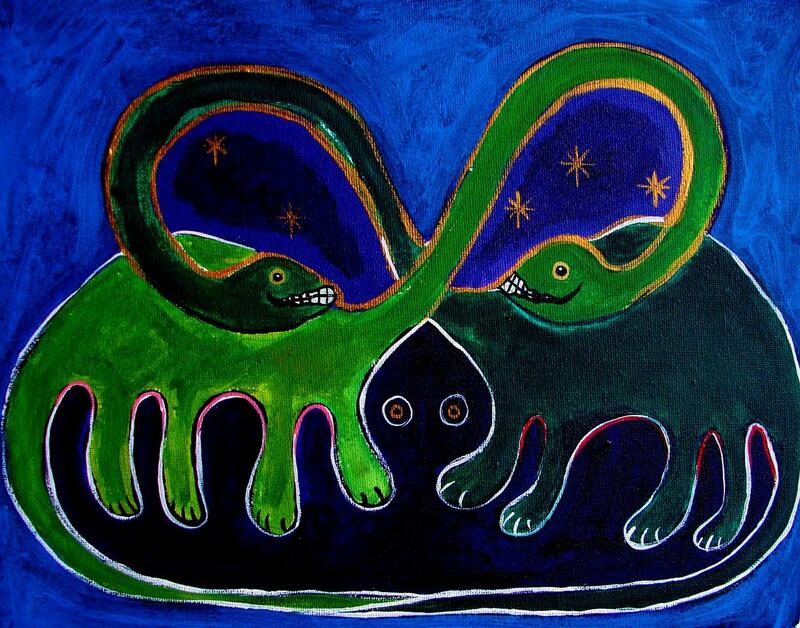 When I was a child I liked playing with series of numbers in my head, before falling asleep in the evenings. The Fibonacci series is familiar to me because of those nocturnal counting sessions: every number is the addition of the two previous numbers! The Fibonacci sequence is found in nature in the formation of seashells, the number of spirals in the seed pots of sunflowers, in pine cones and just about every plant and vegetable! 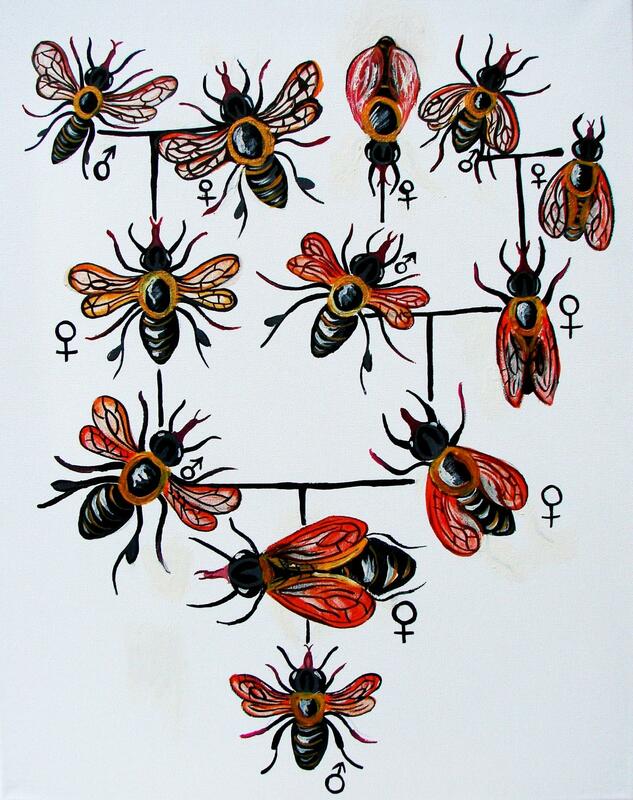 Interestingly it is also found in the family of the Honeybee: to be precise the family tree of the male drone bee! One male drone Honeybee (1) has one parent: the Queen (1), two grandparents (2), three great grandparents (3)... and so forth! In terms of human achievement, the Fibonacci numbers are found in room proportions and building proportions used by architects. Classical music composers have used these numbers as inspiration: Bartok's Dance Suite is believed to be connected to the sequence. As a complete amateur when it comes to mathematics, I remember how certain algebraic equations I encountered at secondary school made me break out in a sweat. They scared the 'living daylights out of me', they looked like monsters to me! 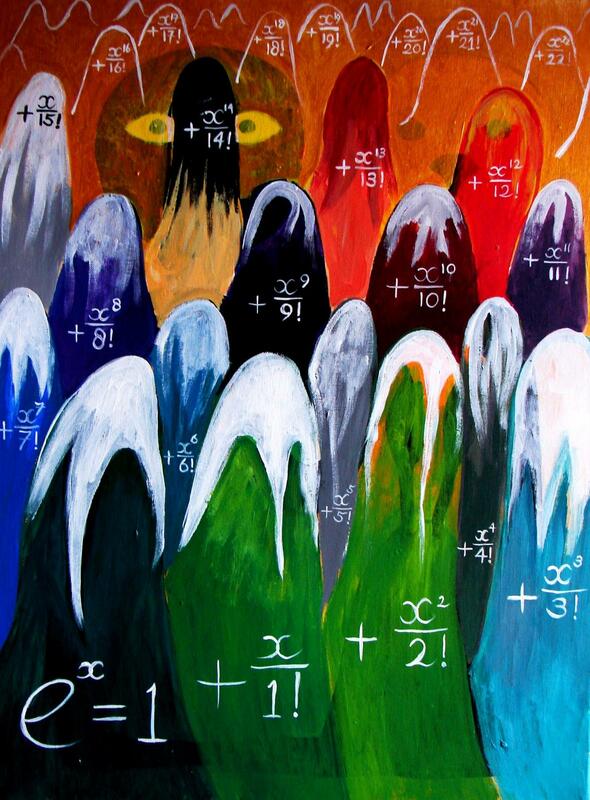 ...mathematical concepts and conclusions have inspired fear even in brilliant mathematicians! In the 19th century the brilliant mathematician Georg Cantor was working hard on his Continuum Hypothesis. In his discovery that there is not just such a thing as infinity, but that there are higher orders of infinity, he was ahead of his times. Most of his colleagues and fellow mathematicians did not want to go there, or feel able to go there, so he ended up struggling in isolation. So actually, mathematical concepts have even frightened brilliant mathematicians on more than one occasion. 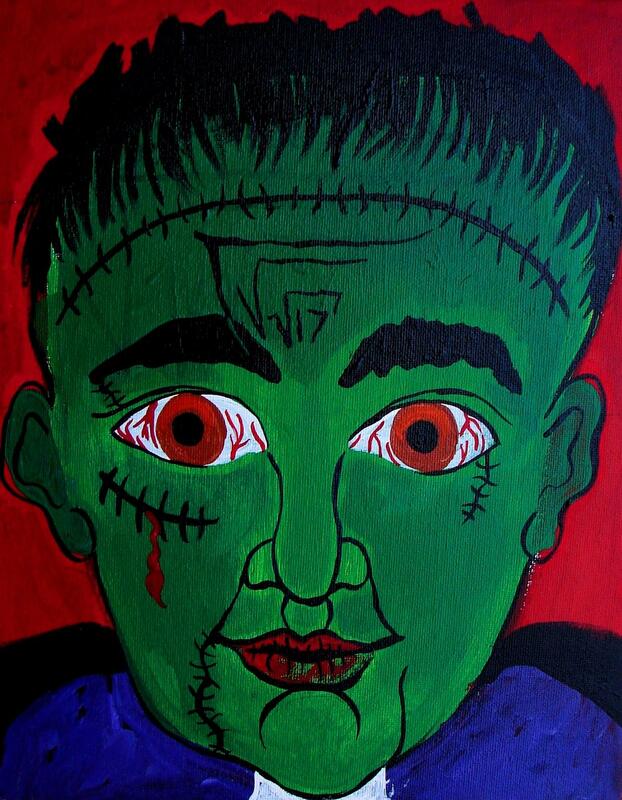 This painting is about certain mathematical concepts or notations turning into 'Frankenstein's monster' and frightening all who come face to face with it! Postscript: Robin Whitty points out that 'nested roots', as the phenomon depicted in this picture is called, are tremendously important in the history of geometry because they exactly delimit what constructions are possible with the Greek 'straightedge and compass' method. A theorem which uses ever more deeply nested square roots to give Pi is Viete's formula: (see www.theoremoftheday.org/Theorems.html#102), as Robin told me over dinner last night. So I shall play detective... I feel a painting coming on! Calculating the value for pi is, in a sense, equivalent to the ancient problem of squaring the circle: for a given circle construct, using a straightedge and compass, a square of equal area. It was finally established in the 19th century that only values which were built up from nested roots were 'constructable'. Now pi can actually not be constructed by a finite number of ruler and compass operations. Viete's formula shows an approximation. He published this formula in 1593 and apparently it is the earliest known infinite product approximation of a number. Personally I think this formula is both elegant and mysterious, a living piece of history! A concept that I personally find very interesting is that of critical mass. The mathematical formula for this is n^2. Critical mass is the point where a process reaches a point or density, where something shifts. Critical mass is the minimum amount of something required to start or maintain a venture (= general wikipedia definition). Critical mass is the minimum mass of fissionable material that sustain a chain reaction (and I guess that's chemistry). Criticall mass is the condition of temperature and pressure above which no distinction exists between a liquid and its vapour. 'As a culture evolves, through the practice of what they already know, people become more and more prepared to know more. So there is eventually a critical moment in which a new idea can come into the group mind of the culture because the culture has in its evolution arrived at the first moment where it is capable of having that idea'. Thus speaks Ralph Abraham in Twilight of the Clockwork God. He talks about a phase change or paradigm shift and says that such transformations happen on 'two sides of an axis', as it were: with the mathematical model on the one side and a cultural manifestation that swings history on its axis, on the other side. Lynn Margulis is a scientist who studies the science of genetics and cell evolution. She makes the same point as Goethe did, speaking as a contemporary microbiologist: 'When you are paradigm shifting, you don't have the language. Whatever you say, people take the words in the context of their paradigm, which makes your scientific life difficult. You don't want to create neologisms. But you are not saying what they think you are saying'. Zeno was a fiendishly clever Greek Philosopher. He came up with some of the most mindboggling paradoxes in world history! His paradoxes challenge the reality of plurality and continuity. His most famous paradox is known as The Dichotomy. It looks very simple and it appears in two of his most famous paradoxes: 'The Racetrack' and 'Achilles versus the Tortoise'. Basically he says that you can never cross a road, (or close a door, or win a race...) because before you can get all the way across the street, you have to reach the halfway point. And obviously before you can get halfway across, you first have to get to the halfway point of getting halfway across... and so forth. This is known as the dreaded 'regressus in infinitum', also known as the Vicious Infinite Regress or VIR. 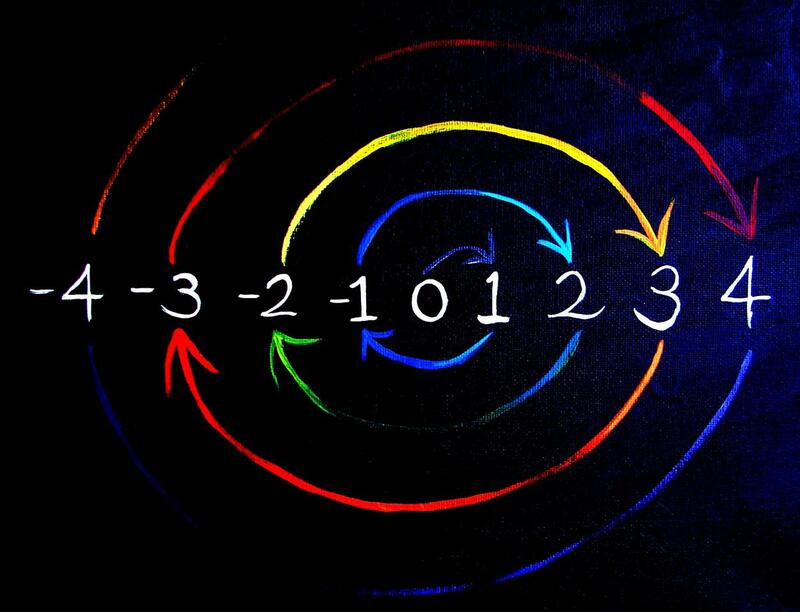 Now a mathematician can come up with a formula to answer Zeno's dichotomy. (In case you want to know, that formula is a/(1-r)...) Obviously we all know from everyday experience that doors do shut, people cross streets and catch buses every day! A very simple mathematical concept that has profound implications, or so it seems to me, is that of an infinitely large circle. Or is it a case of there being many valid viewpoints, depending on who you are, where you are and what you are looking at?! 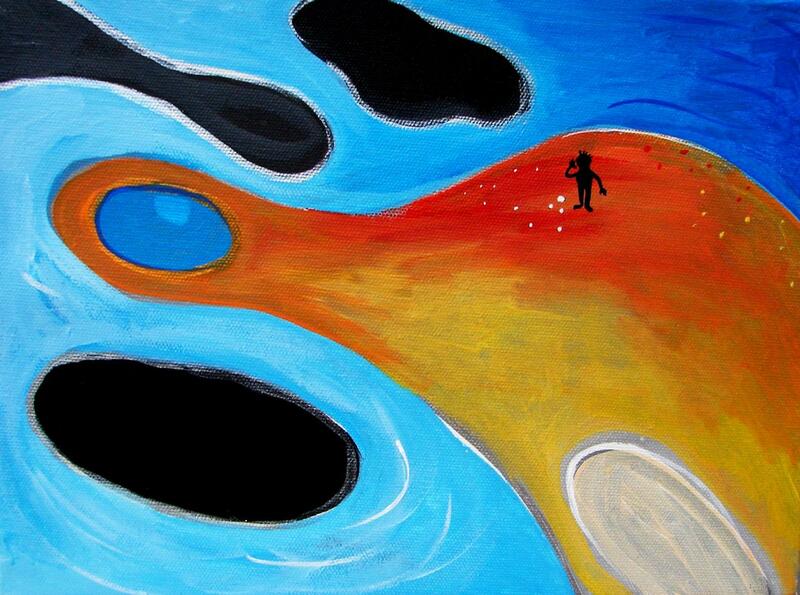 This painting was inspired by an illustration in a science book about how light behaves once enters a black hole. Essentially it becomes trapped. The gravity in a black hole is such powerful that even light particles can't escape it. Within mathematics there exists a field known as Chaos Theory. Now, isn't that a contradictio in terminis, if there ever was one?! In the 19th centure a belief ruled the world that if we knew all positions, velocities and forces of all objects in the universe, then these quantities could be calculated exactly for all future times. This was the theory of a man called Marquis Pierre-Simon de Laplace, who mentioned this in an essay he published on the deterministic universe. The general belief was that small discrepancies in initial conditions meant small discrepancies in outcomes. Chaos Theory exploded this idea!! We have all heard about a butterfly flapping its wings in Brazil and this resulting in a storm on the other side of the planet. Now this is Chaos Theory in action! 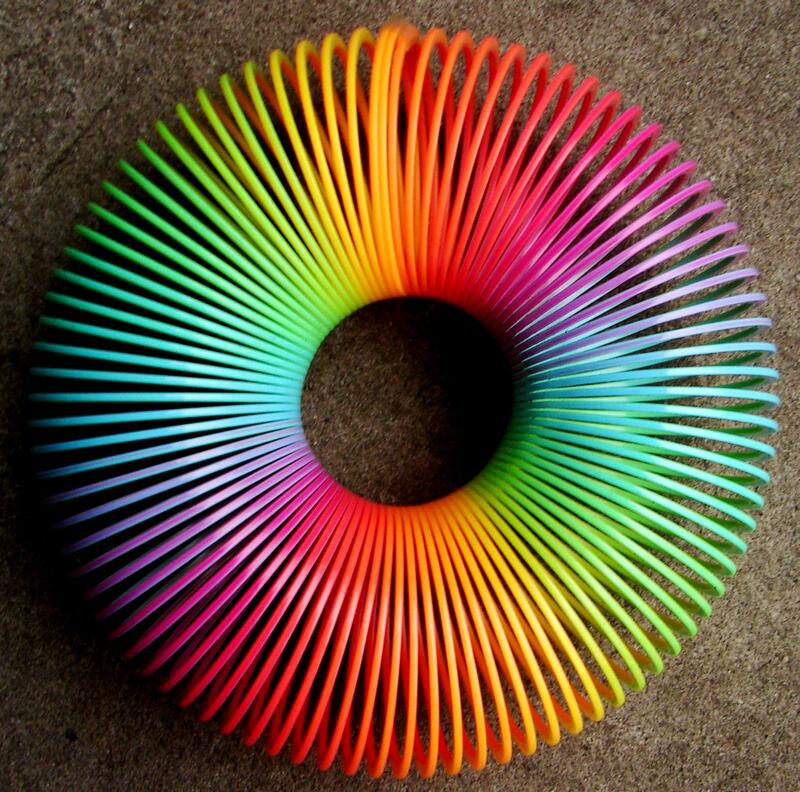 A characteristic of chaos is that a deterministic system may appear to generate random behavior. This is why forecasting the weather is so difficult, even with very powerful computers. The equations that 'govern' the weather are non-linear: they involve the variables multiplied together and not just the variables themselves. One definition of Mathematics is to say that it is the science of finding patterns to patterns. Within the concept of patterns, fractals are a very interesting concept. Fractals are patterns built up by means of a repetition that changes the scale at each application. They can be found all over the natural world, in the patterns of branching trees, plants and clouds. Snowfakes are an excellent example as well. The thing about fractals is that they look the same under the microscope as to a human eye without magnification! As an aside: the blue pictures above are NOT recent paintings! I took these photographs at sunrise on January 2nd 2017 , at London Stansted Airport. 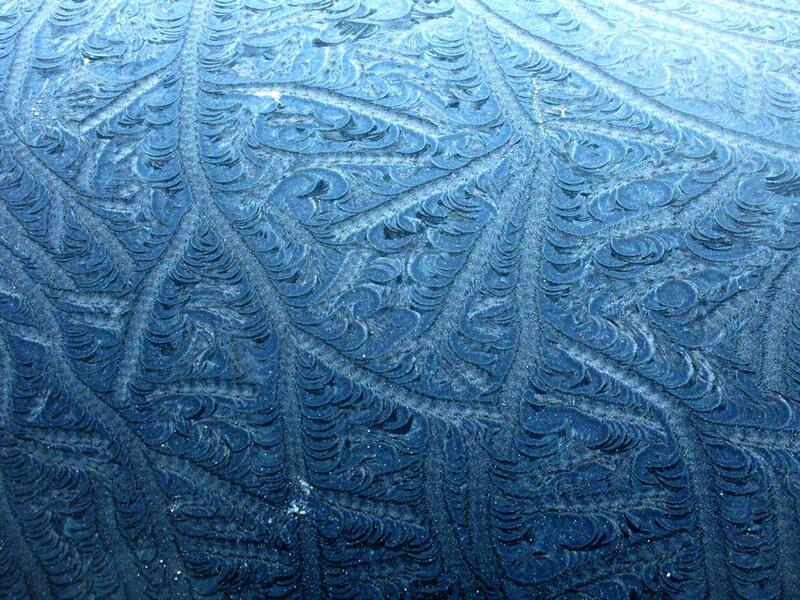 They are frost patterns on parked cars. I was mesmerized by their beauty and did some research. 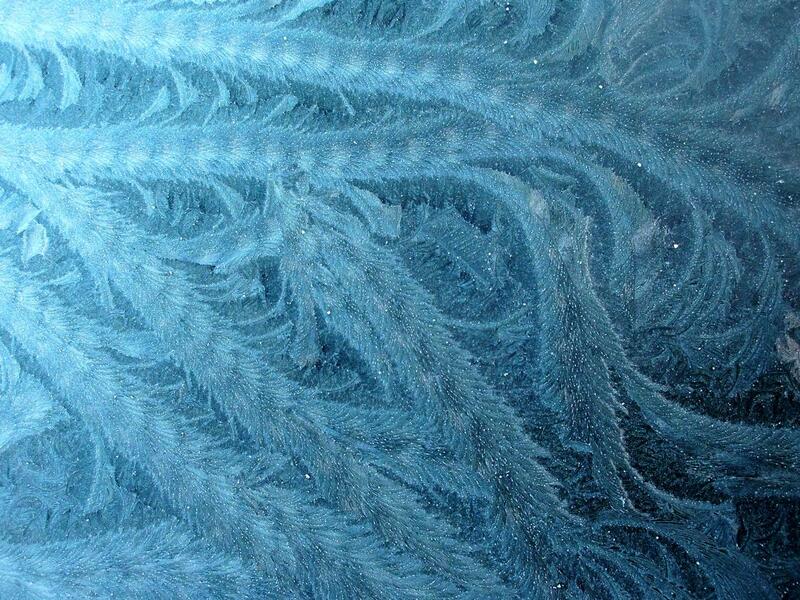 I discovered that frost patterns are essentially fractals. Use this link for more information! We have already come across a fractal on this webpage: the 'Sierpinsky Gasket' in the painting 'Pascal's Pyramids'. This is the 'Sierpinsky Gasket'. 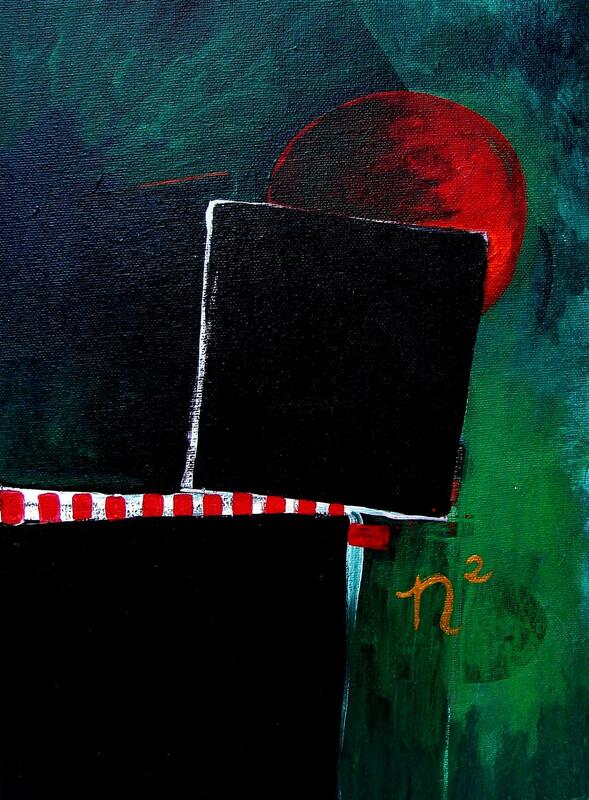 It is a detail of a small painting enlarged and therefore quite crude. In reality every triangle in the image would contain an infinity of smaller triangles. It is never ending and quite mind boggling! As I said in the previous section: 'Chaos Theory' sounds like a contradiction in terms, you would think that Chaos is what happens where all theories fail. This is not quite true. There is a branch of mathematics called 'Dynamical Systems Theory'. It is based upon the creation of mathematical models of dynamical processes in nature. It has been discovered that when systems enter states of turbulence (think of boiling water or epileptic seizures) they are actually entering into states of organisation so infinitely complex, that they only appear to be disordered. This is referred to as 'the self organizing properties of chaos'. Now ask mothers of small children about the Self Organising Properties of Chaos...! Or in the words of the Kaplans: mathematics lies in an enchanted world somewhere between reality and imagination. Cantor is best known as the creator of Set Theory. He established the one-to-one correspondence between sets and proved that Real Numbers are more numerous than the Natural Numbers. His most famous piece of work is the Continuum Hypothesis. The Transfinite Cardinal of the sets that Cantor established is sometimes called E, or the 'smallest' transfinite number. 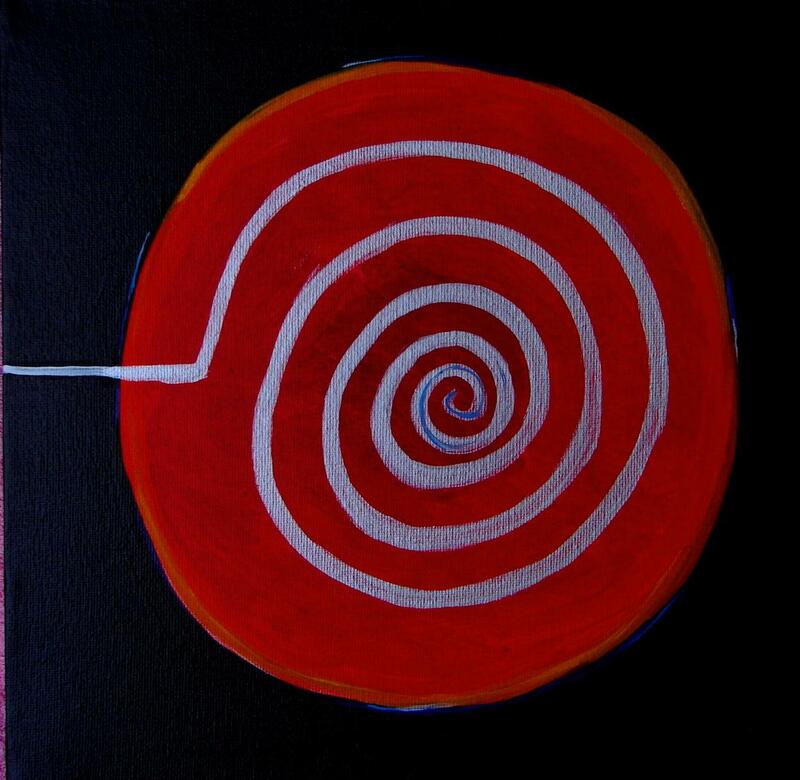 Robin Whitty comments that my painting shows the integers being put into one to one correspondence with the nonzero integers (so Lazy 8 + 1 = Lazy 8). Such correspondences are certainly at the heart of what Cantor did but there are examples which are more representative. Perhaps the most famous one is the one to one correspondence between the natural numbers and the positive fractions. Between any two whole numbers there are infinitely many fractions. Indeed, between any two fractions, however small, are infinitely many more fractions. So it is quite astonishing that there should be the same number of fractions as whole numbers! But such is the case and it is quite easy to see how. 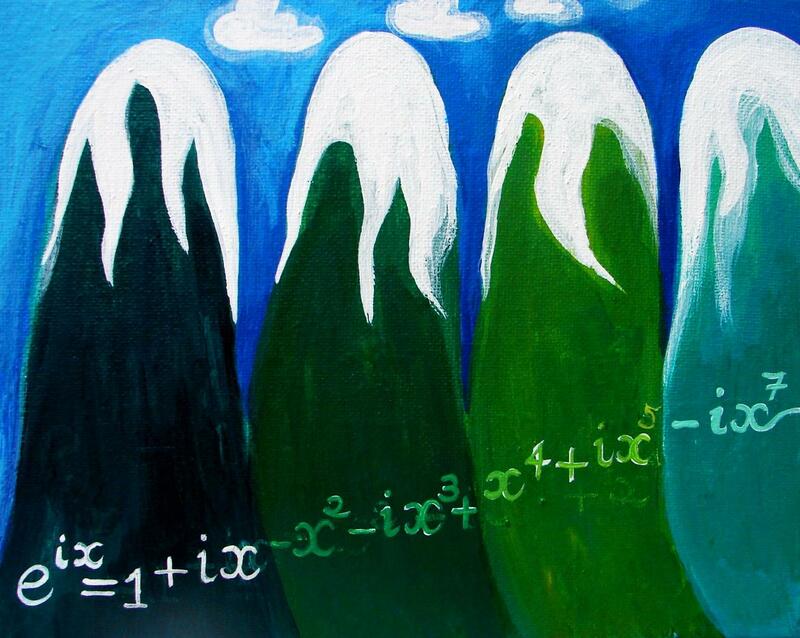 In the following painting two entirely seperate and unlikely sources of inspiration come togeter: the Banach-Taski Paradox & Well Ordering Theorem and a comment made by my 4 year old son. Brendan recently said that he prefers the 'Orange Moon' (i.e. the full moon) to the 'Banana Moon' (i.e. the waxing or waning crescent moon). 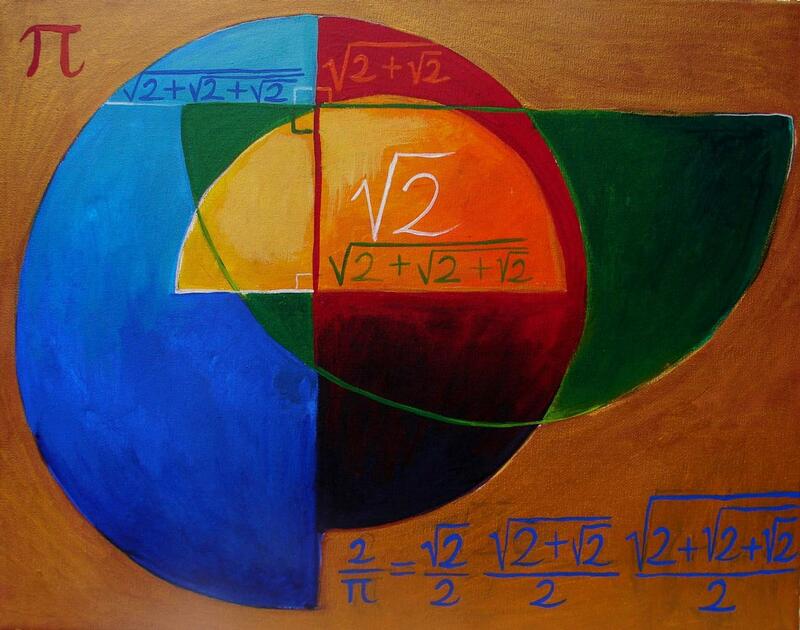 Around the same time Robin Whitty kindly gave me some feedback on my paintings about mathematical concepts. He mentioned that the Banach-Taski Paradox would be a favourite theorem with many mathematicians. I checked this out and learnt that in mathematical terms it is possible to cut an orange in five pieces which can then be rearranged to form a ball the size of the moon (or sun)! Robin explains on his webpage that this notorious paradox is a bit of cheat because the pieces must be very complicated and they will make up a moon with a huge amount of empty space. Having said that: a mathematical orange has an infinity of material and infinity can fill up as much space as you need it to. At least it can if it is well-ordered! And so in this painting my son's comment and Robin's intriguing Well Ordering Theorem come together. A reconstructed orange makes an Orange Sun and a reconstructed banana makes a Banana Moon! I would like to thank the following mathematicians for taking the time to answer questions and engage with me on the most basic level (so I would have a hope of understanding! ): Robin Whitty (in London), Gerard Michon (in Los Angeles), Evelien Bus and Bob Rink (both in the Netherlands). Obviously any remaining errors and dodgy bits are entirely of my own making! I would also like to say thank you to Judith Bogner (a TV presenter, not a mathematician!) for coming up with the concept of the Lazy 8 London Bus to Infinity! For those of us who have small children - or remain children at heart! - here follows a list of the names of 'really big numbers'. My three sons often ask me for 'the name of the largest number known to man'. They talk about zillions and gazillions... I called my 8 year old son in right now and asked him for 'the largest number known in the school playground'. His answer was: million-billlion-zillion and hundreds of thousands! So what are the names of really large numbers? !